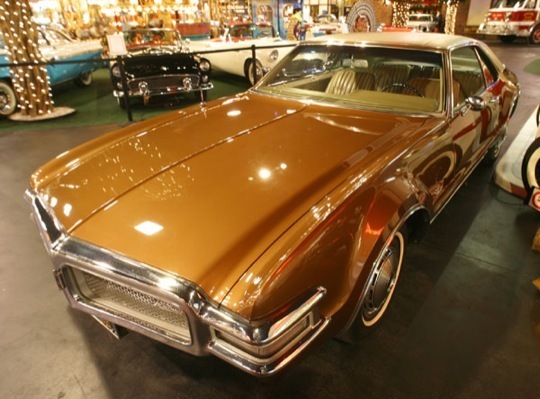 The Toronado was a two-door coupe produced by the Oldsmobile division of General Motors from 1966 to 1992. 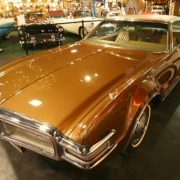 The name “Toronado” has no meaning, and was originally invented for a 1963 Chevrolet show car. 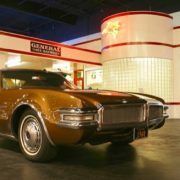 Conceived as Oldsmobile’s full-size personal luxury car and competing directly with the Ford Thunderbird, the Toronado is historically significant as the first front-wheel drive automobile produced in the United States since the demise of the Cord in 1937. 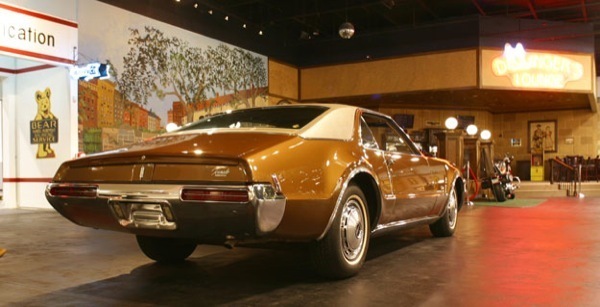 The Toronado was structurally related to the 1966 rear-wheel-drive Buick Riviera and the following year’s Cadillac Eldorado, although each had quite different styling. 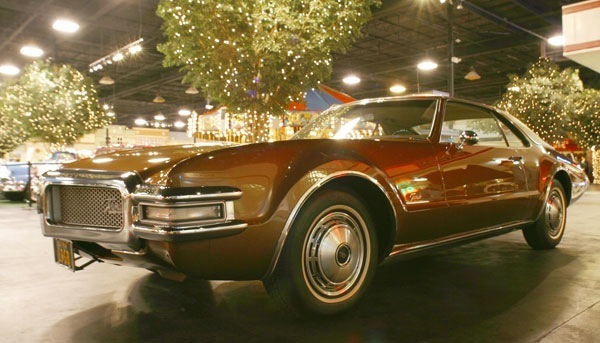 The Toronado continued to share its E-body platform with the Riviera and Eldorado for most of its 28-year history. 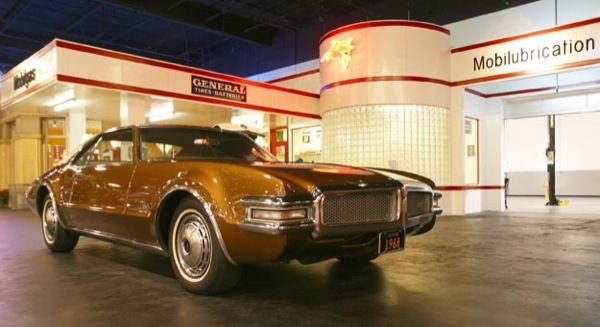 Buick Riviera did not switch to front-wheel drive until the 1979 model year. 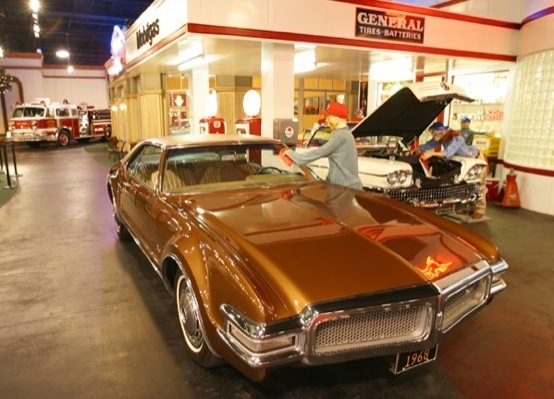 The original Toronado began as a design painting by Oldsmobile stylist David North in 1962. His design, dubbed the “Flame Red Car,” was for a compact sports/personal car never intended for production. 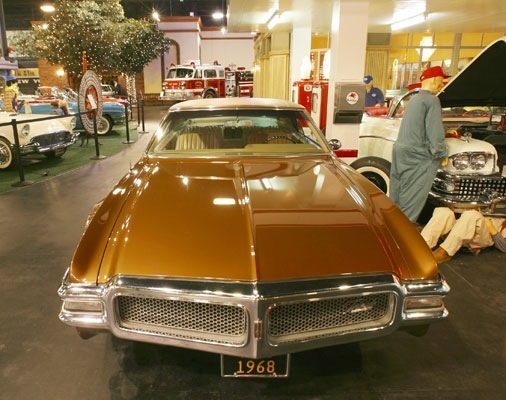 A few weeks after the design was finished, however, Oldsmobile division was informed it would be permitted to build a personal car in the Riviera/Thunderbird class for the 1966 model year, and North’s design was selected. 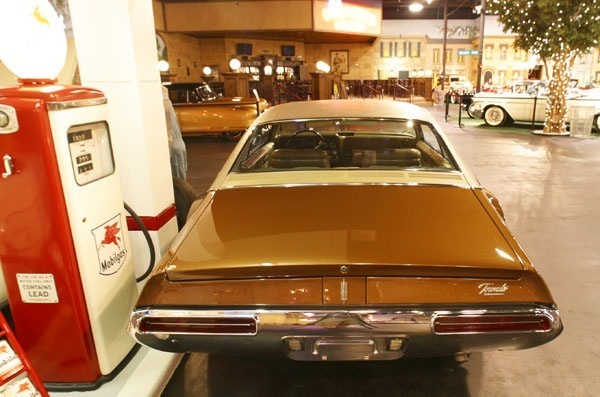 For production economy, the still-unnamed car was to share the so-called E-body shell with the redesigned 1966 Buick Riviera, which was substantially bigger than North had envisioned. 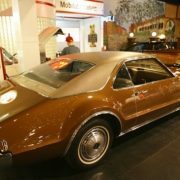 Despite the efforts of Oldsmobile and General Motors styling chief Bill Mitchell to put the car on the smaller A-body intermediate, they were overruled for cost reasons. 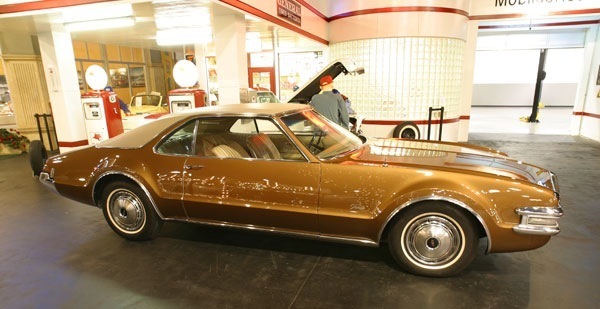 Oldsmobile had been working on front-wheel drive since 1958, a project shepherded by engineer John Beltz (who originated the 442 and would later become head of the division). Although initially envisioned for the smaller F-85 line, its cost and experimental nature pushed the program towards a larger, more expensive car. 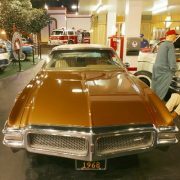 Engineer F. J. Hooven of the Ford Motor Company, had patented a similar FWD layout, and Ford was seriously considering the design for the 1961 Ford Thunderbird. 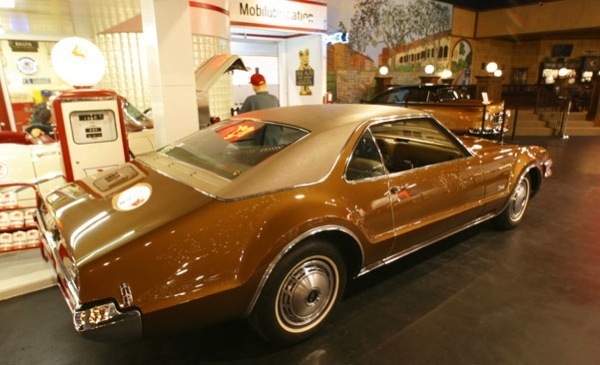 However, the time to develop and engineer such a design in such short notice made this a doubtful proposition.Oldsmobile spent seven years developing the Toronado. 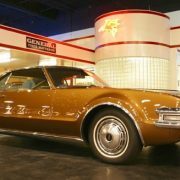 Prior to its introduction to the public, over 1.5 million brutal test miles had been performed to verify the strength and reliability of the Toronado’s front-drive components. 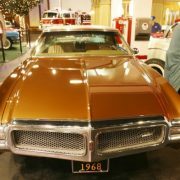 Obviously, Oldsmobile did not want anyone to experience problems with the new design. 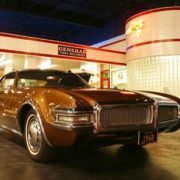 History has confirmed the Toronado design was indeed heavily over-built; the GMC motorhome of the 1970s, which used a basically unchanged Toronado-derived drivetrain, stands as a testament to that fact. 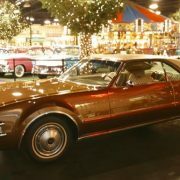 Nevertheless, the re-introduction of front wheel drive earned the new Toronado Motor Trend “Car of the Year” honors in 1966. 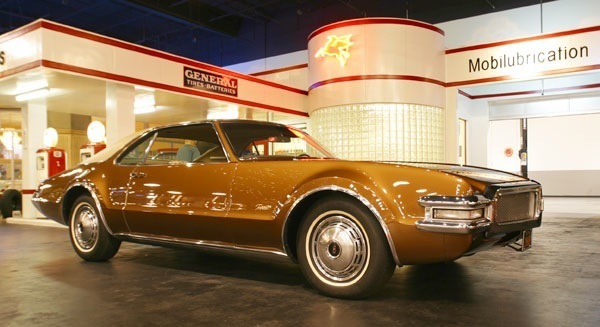 Naming the Toronado was also an event in itself. Some other known names being considered during development are: Magnum (later used by Dodge), Scirocco (later used by Volkswagen) and Raven. 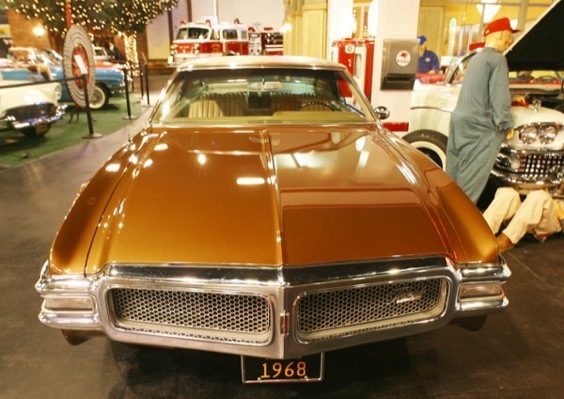 Firestone also designed an 8.85″ x 15″ tire especially for the Toronado called the TFD (Toronado-Front-Drive) tire. 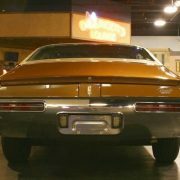 It had a stiffer sidewall than normal, and the tread and stylishly thin white pin-stripe were also unique. 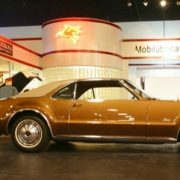 To power the car, Oldsmobile engineers selected a conventional, although performance-boosted, Olds 425 cu in (7.0 L) Super Rocket V8 rated at 385 hp (287 kW) and 475��ft lb (644 Nm) of torque. 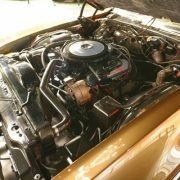 It provided an increase of 10 hp (7 kW) over the Starfire 425, and an increase of 20hp (15kW) over the standard 425 engine in the Ninety-Eight. 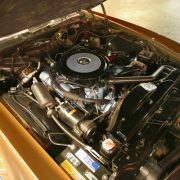 The Toronado’s intake manifold was unique and was depressed down to allow for engine hood clearance. 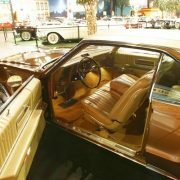 The Turbo-Hydramatic heavy-duty 3-speed automatic transmission, (or THM400, TH400) came about during development of the Toronado. 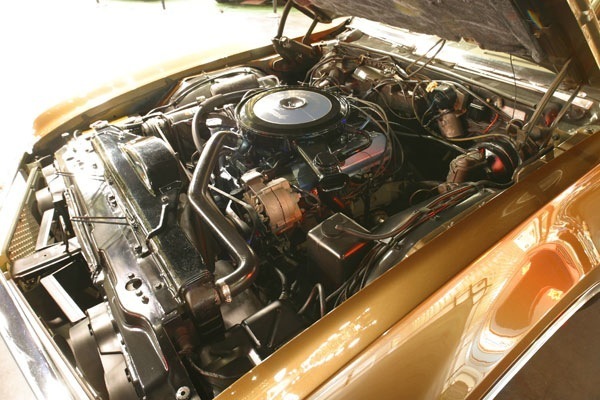 Called the TH425 in FWD form, the transmission’s torque converter was separated from its planetary gearset, with the torque converter driving the gearset through a 2″ wide silent chain-drive called Hy-Vo, riding on two 12″ sprockets. The Hy-Vo chain drive was developed by GM’s Hydra-Matic Division and Morse Chain Division of Borg-Warner. The chains were made from a very strong hardened steel and required no tensioners or idler pulleys because they were pre-stretched on a special machine at the factory. 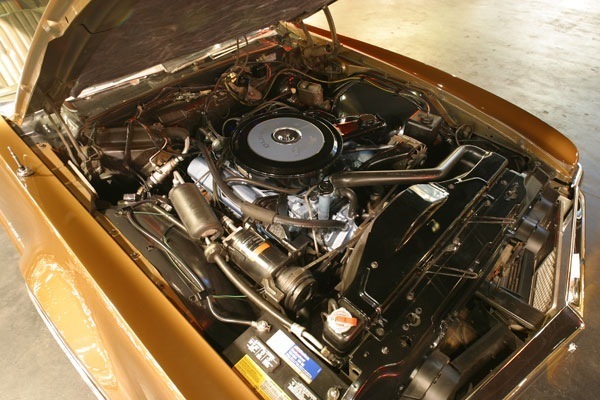 Although the rotation direction of the transmission’s gearing had to be reversed, a large number of components were shared with the conventional TH400. 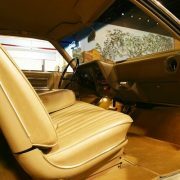 Use of the automatic also obviated the need to devise a workable manual-shift linkage; no manual transmission was ever contemplated, as engineers deemed performance to be adequate with the automatic transmission and the fact that virtually all U.S.-built luxury cars during this period came with automatic transmissions as standard equipment.he Toronado was GM’s first subframe automobile, which means it was partly unitized, and used a subframe that ended at the forward end of the rear suspension leaf springs, serving as an attachment point for the springs. 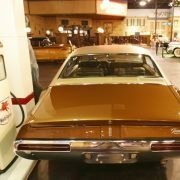 It carried the powertrain, front suspension and floorpan, allowing greater isolation of road and engine harshness (the design was conceptually similar to the Chevrolet Camaro and Pontiac Firebird that would debut for 1967). 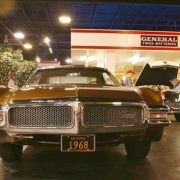 For space reasons, Oldsmobile adopted torsion bars for the Toro’s front suspension (the first GM passenger car application of torsion bars), with conventional, unequal-length double wishbones. Rear suspension was a simple beam axle on single leaf springs, unusual only in having dual shock absorbers, one vertical, one horizontal (allowing it to act as a radius rod to control wheel movement). 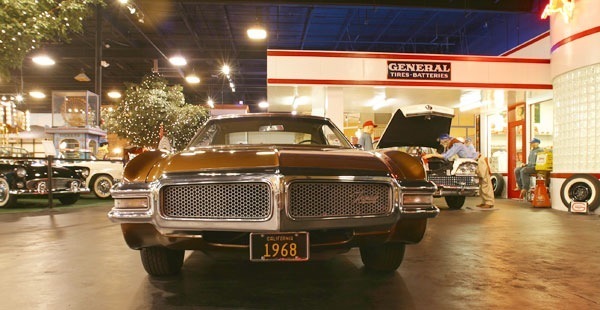 Brakes were conventional drums of 11 inch (279 mm) diameter), which were generally considered the Toronado’s weak link. Being a rather heavy car, after several panic stops, the brake drums would overheat, resulting in considerable fade and long stopping distances. The 1967 addition of front vented disc brakes as an option provided substantial improvement. 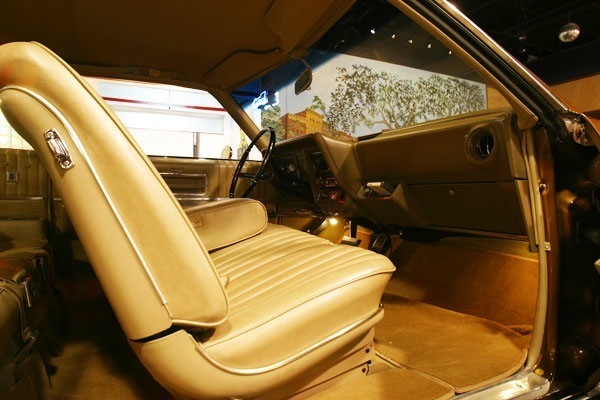 The Toronado’s UPP enabled the interior to have a completely flat floor, but interior space (primarily rear seat headroom) was somewhat restricted by the fastback styling. 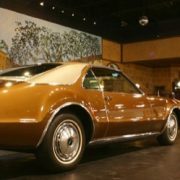 Although a two door coupe, the Toronado featured elongated doors, allowing easier access for passengers boarding the rear seating area. 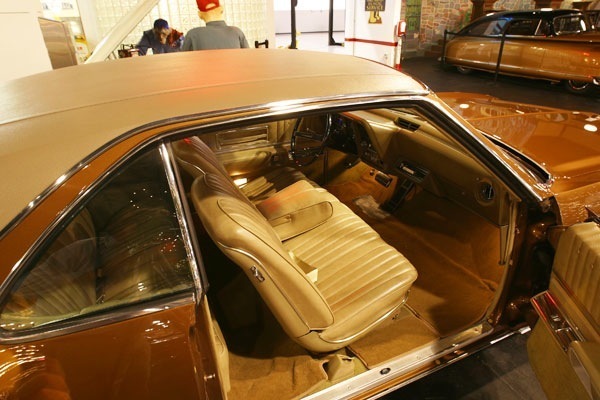 Even rear-mounted handles were available optionally to enable rear-seat passengers to open the doors without reaching across the front seat back; this feature was also available on Imperial cars of the era. 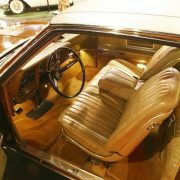 Drivers faced a highly stylized steering wheel with a double-delta shaped horn ring, which framed the view of an unusual speedometer which consisted of a stationary indicator “needle” and a vertically rotating drum on which the numerals were printed. All other gauges, indicators and controls were grouped within fairly easy reach of the driver. 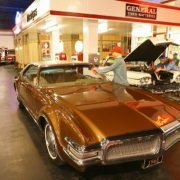 Despite an average test-weight approaching 5,000 lb (2,300 kg), published performance test data shows the 1966 Toronado was capable of accelerating from 0 – 60mph (0-97km/h) in 7.5 seconds, and through the standing 1/4 mile (~400 m) in 16.4 seconds at 93mph (150km/h). It was also capable of a maximum speed of 135 mph (217 km/h). Testers found the Toro’s handling, despite its noticeable front weight bias and consequent understeer, was not substantially different from other full-size American cars when driven under normal conditions. 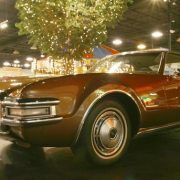 In fact, many contemporary testers felt that the Toronado was more poised and responsive than other cars, and when pushed to the limits, exhibited superior handling characteristics, although it was essentially incapable of terminal oversteer. 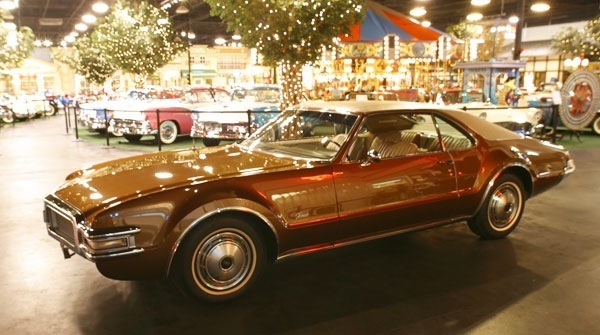 A special option code called W-34 was available on the 1968-70 Toronado. 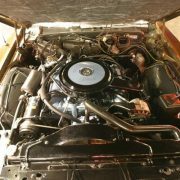 This option included a cold air induction system for the air cleaner, a special performance camshaft and a “GT” transmission calibrated for quick and firm up-shifts and better torque multiplication at 5 mph (8 km/h). 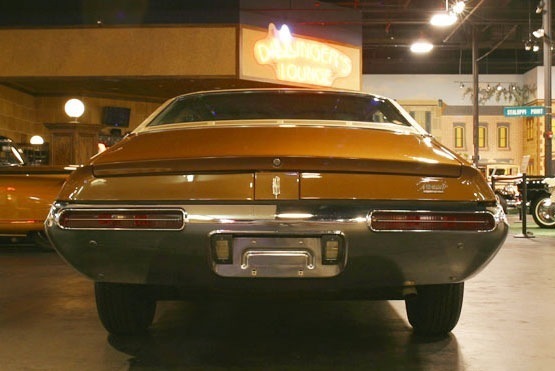 Dual exhaust outlets similar to the 1966-67 model years with cutouts in the bumper were also included with W-34. 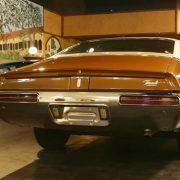 The standard models did have dual exhaust systems, but only a single somewhat hidden outlet running from the muffler exiting rearward on the right side. For 1970 only, the W-34 option also included special “GT” badges on the exterior of the car. 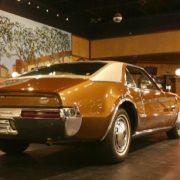 The W-34 Toronado was capable of 0-60 mph in 7.5 seconds and the standing 1/4 mile in 15.7 seconds at 89.8 mph (144.5 km/h).The Toronado sold reasonably well at introduction, with 40,963 produced for 1966. 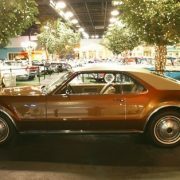 The car also gained great publicity for the division by winning several leading automotive awards, such as Motor Trend’s Car of the Year Award and Car Life’s Award for Engineering Excellence. It also was a third-place finisher in the European Car of the Year competition. 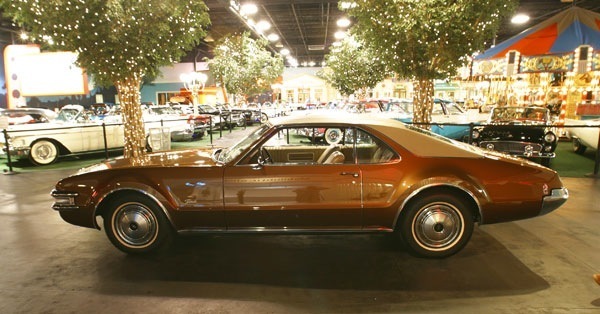 Sales for the 1967 model, which was most notably distinguished by a slight facelift, the addition of optional disc brakes, and a slightly softer ride, dropped by nearly half, to 22,062. It would be 1971 before the Toro would match its first-year sales mark. 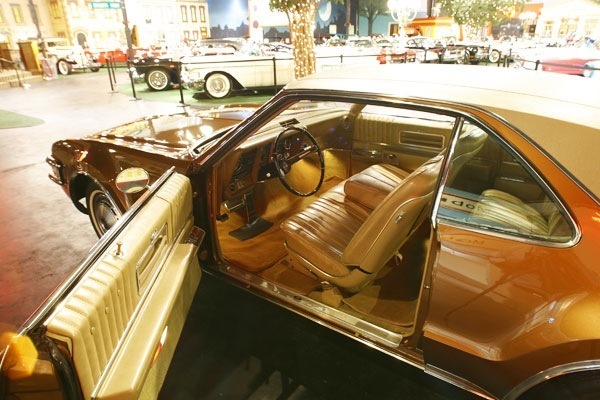 In 1967 Cadillac adopted its own version of the UPP for the Cadillac Eldorado, using the Cadillac V8 engine. 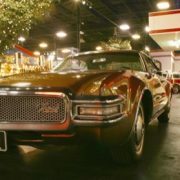 The Eldorado also shared the basic E-body shell with the Toronado and Riviera, but its radically different styling meant that the three cars did not look at all similar. 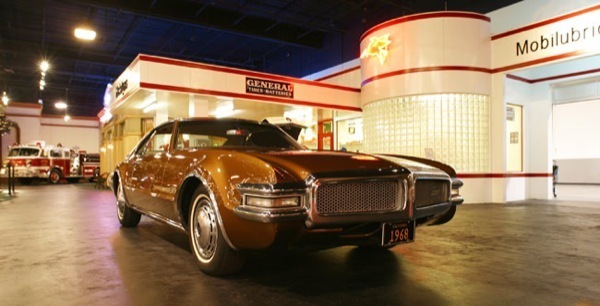 The first-generation Toronado lasted with the usual annual facelifts through 1970. 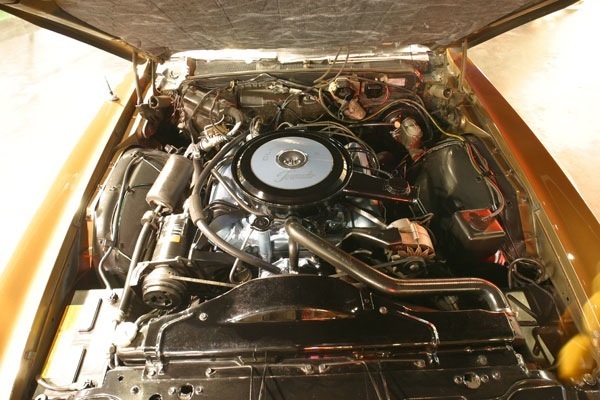 Other than the brakes, the major changes were the replacement of the original 425 cu in (7.0 L) V8 with the new 455 cu in (7.5 L) in 1968 that was rated at 375 hp (280 kW) in standard form or 400 hp (300 kW) with the W-34 option, revised rear quarter panels (with small fins to disguise the slope of the rear body in side view) in 1969, and the disappearance of hidden headlights and the introduction of squared wheel arch bulges in 1970. 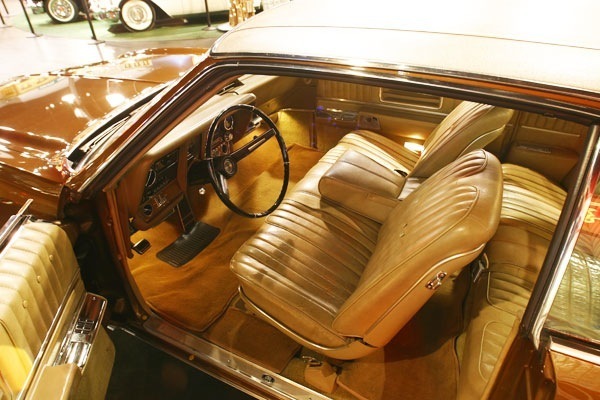 Slight interior cosmetic changes were also implemented for each new model year, and a full-length center console with floor-mounted shifter was available as an extra-cost option with the Strato bucket seats from 1968 to 1970, though few Toronados were so ordered. 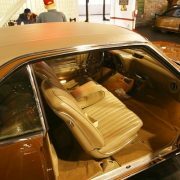 The vast majority of customers went for the standard Strato bench seat to take full advantage of the flatter floor resulting from the front-drive layout; the lack of a “hump” in the floor made three-abreast seating more comfortable than in rear-drive cars, as the center passengers both front and rear did not have to sit with their legs in an awkward position. 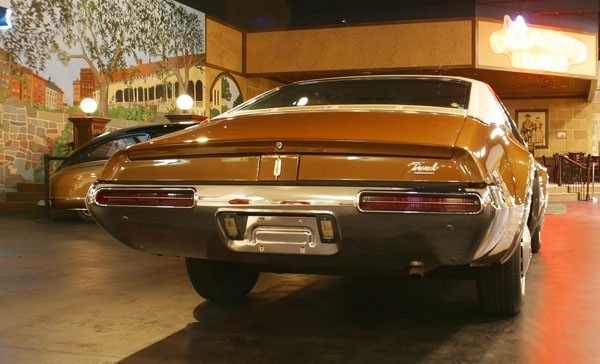 The firmness of the suspension, and thus the quality of the ride, was gradually softened through the years as well, hinting at what Toronado eventually would become in 1971. 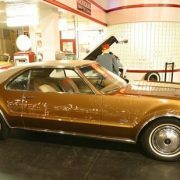 Interestingly, a heavy-duty suspension was offered optionally on later first generation Toronados, which included the original torsion bar springs that were used on the 1966.